Teens are a high-risk group for drug abuse, and are one of the most important groups to reach out to, because they are our future, our children, and the hope of our nation. And they’re at risk. Statistics tell us that people are most likely to begin abusing drugs during their teenage years. By the time they are seniors, almost 70% of high school students will have tried alcohol, 50% will have taken an illegal drug, nearly 40% will have smoked a cigarette, and more than 20% will have used a prescription drug for a nonmedical purpose. Why Do Teens Experiment With Drugs? Teens are the hope of America’s future. Our future lies with them. More than that, they are our children, here and now. 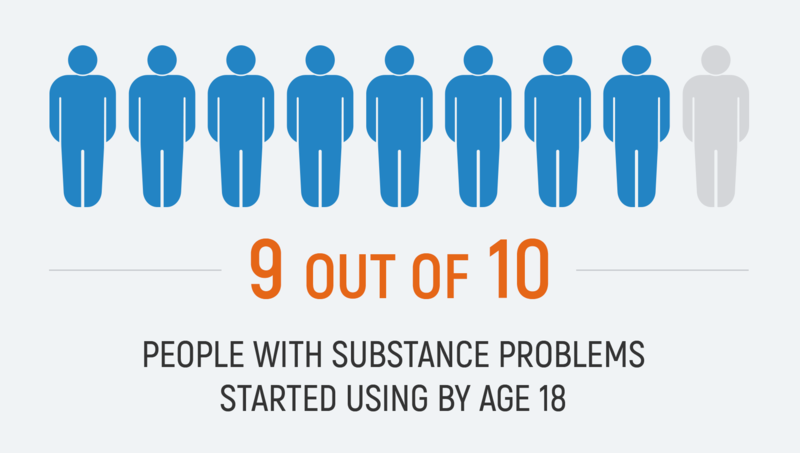 Teens are statistically one of the highest risk groups for drug abuse. This is primarily because of peer pressure, newfound social freedom, new social situations, stress at home or in school, and curiosity. Overall teen drug use seems to be declining compared to previous years, but we cannot become complacent, because teens who DO abuse illicit and prescription drugs remain at risk for addiction and overdose. 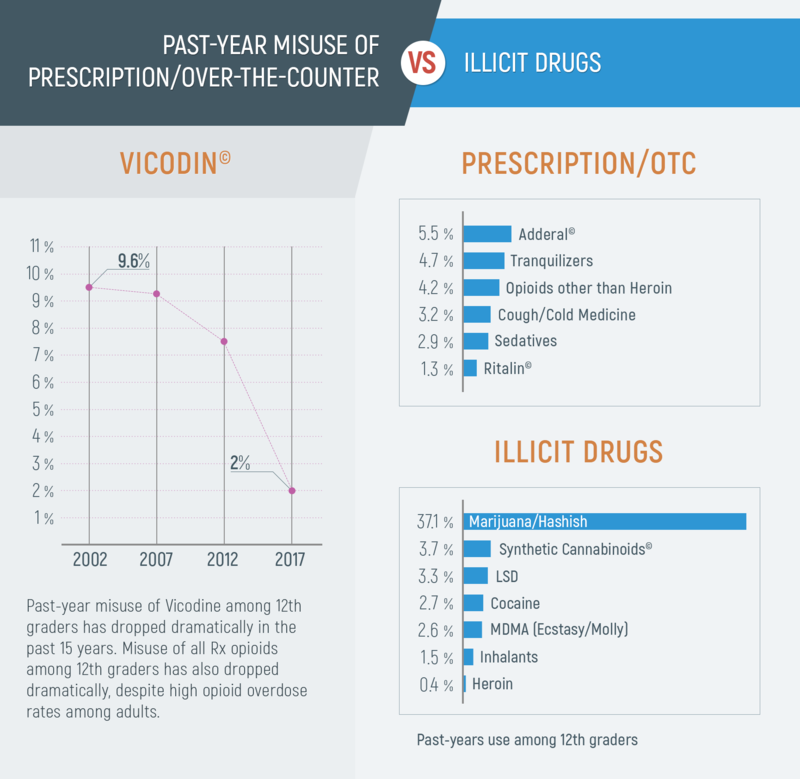 The good news is that, according to the most recent statistics from the National Institute on Drug Abuse (NIDA), overall teen substance use is lower than in previous years, not higher. The bad news is that it’s still too high, especially with regard to marijuana. NIDA’s yearly report, the Monitoring the Future Survey, asked over 50,000 students in hundreds of schools around the country to self-report their substance use during the past month. And taken as a whole, many of the resulting figures are down from last year. 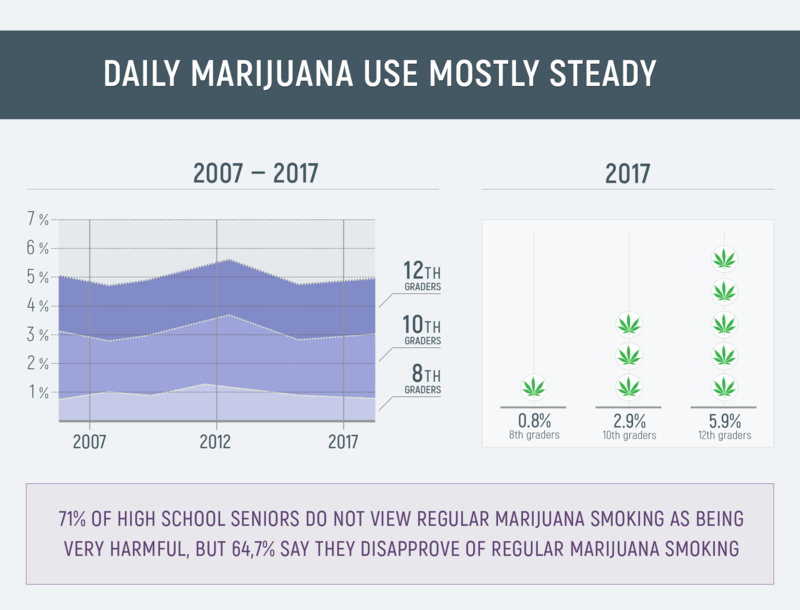 On the other hand, 14.5% of the students surveyed reported having used marijuana during the previous month, and that’s the highest percentage found in this survey since 2013. What percentage of high school students use drugs? Remember, these are combined figures. When you break them down by the individual grades, they are even more interesting because they point out that the substance abuse is not limited to those in the upper grades, as many parents might hope. According to a separate survey conducted by the University of Michigan, more than 35% of 12th graders use marijuana, a higher rate than any other drug. The same is true of 8th graders. Alcohol and tobacco abuse in 8-12th graders continues to decline, but those who abuse illicit drugs and prescription drugs are still at risk of addiction. According to the Monitoring the Future Survey, experimentation is still in full swing. That is, they found that 45% of teens surveyed reported having tried marijuana at least once by the time they’re in the 12th grade. But to balance that, fewer than 23% of them reported having used it in the past month, so smoking it isn’t a regular thing for them. The survey further found that only 5.9% of 12th graders and 2.9% of 10th graders smoked marijuana on a daily basis. And over 64% of students in all three grades surveyed said that they disapproved of regular marijuana use. Past research has suggested that many teens started using substances such as cigarettes, inhalants, amphetamines, and alcohol in elementary school, before they even get to high school. And nearly 13% admitted to having tried marijuana by the end of the 8th grade. Where Do Teens GET All These Drugs? There are a remarkable number of sources for illegal drugs, many of them available to teenagers. 60% of teens in recent studies report that they get them at school. Some get them at home, or from friends’ houses with similarly unsupervised medicine cabinets. They can purchase over-the-counter medications such as cough medicines, diet pills, and non-opioid pain relievers at their nearest grocery store or pharmacy. And sadly, teens tend to know more about the Internet than their parents do, so they can often find access to drugs ranging from marijuana to fentanyl to heroin on the Dark Net. The teen years are a time when young people are open to new experiences, and they may wonder what drugs are like. They may have been inundated with warnings about the dangers of drug use, but at the same time they’re also curious to know what being “high” is like. In many cases this curiosity overrides any worries they might have about the drugs being as dangerous as the warnings make them seem. Teens’ brains are not fully developed in the area of the brain responsible for thinking ahead and understanding consequences, so they can often feel invincible and believe that bad things like addiction won’t happen to them. Unfortunately, this is often not the case. Teens often want to try as many new things as possible, and drugs are unfortunately one of the most common experiments they attempt. Drinking alcohol is also a very common activity teens engage in. Kids in their teen years often want to feel like they are part of the group, or that they “fit in.” Sometimes they drink or try drugs to fit in with a particular crowd or friend, or they may do it to appear “cool” or worldly to impress others. While some will do this with no long-term consequences, others will become addicted. Between social pressures, extracurricular activities, and classes, teens have a lot on their plates. Add in the stress of attempting to decide on a choice of college and major course of study, and some may find themselves overwhelmed. Sometimes, teens turn to drugs and alcohol to help them cope with the rigors of high school and the first few years of college. The drug Adderall is especially common among young students because, as a stimulant, it helps them stay awake longer to get more studying done. It has been shown that teens who come from broken homes, those with dysfunctional home lives, or those with mental illness or mood disorders are more likely to use drugs and alcohol. This is usually because the drugs help numb their emotional pain and allow them to escape from negative feelings. Self-medication is a dangerous cycle, however, and one that quickly leads to substance abuse and addiction if the underlying issues are not dealt with quickly. Teenagers are extraordinarily vulnerable to substance use disorders, because their brains are still developing, and some brain regions are less developed than others. The area of the brain that processes responses to reward and pain matures early in childhood. But the prefrontal cortex – the brain region responsible for accurately assessing a situation, making sound decisions based on that assessment, and exercising control over our emotions and impulses – remains relatively undeveloped during our teen years. This area doesn’t fully mature until the mid-20s. Largely as a result, the teenage brain has been likened to a car with a fully functioning gas pedal (the reward system) but weak brakes (the prefrontal cortex). Physiologically, teens are as capable of pursuing pleasurable rewards and avoiding pain as an adult, but they still have serious limits on their ability to weigh risks accurately and to make sound decisions. This includes, of course, decisions about whether or not to use drugs. Our brains are “hard-wired” to pursue life-positive and healthful activities because our brains release of a chemical called dopamine. Normally, the everyday rewards that result from normal teenage activities such as hanging out with friends, playing sports or games, and listening to music cause the moderate release of this chemical. The resulting dopamine increase thus reinforces behaviors that contribute to health, developing a sense of well-being, and building strong social bonds. Drugs hijack this process. The “high” that drugs produce floods the teenage brain’s reward centers with much greater amounts of dopamine than usual. This creates a strong urge to repeat the experience. The immature brain, which is already trying to balance impulse and self-control without the fully developed tools to do so, is thus more likely to take drugs again, and without paying any attention to possible negative consequences. If the drug experience is repeated, that reinforces the brain’s links between pleasure and drug-taking, and makes the association stronger. Soon, taking the drug takes on a much greater importance in the teen’s life than other rewards. This is the vicious cycle of addiction. The drugs realign the teen’s priorities, but at the same time they are chemically modifying the very brain regions needed to use proper judgment and exercise control. Control such as deciding to stop using drugs. Despite popular belief, willpower alone is often insufficient to overcome an addiction. Drug use has compromised the very parts of the brain that make it possible to say no to them. This is one of the key reasons why the D.A.R.E. initiative – based as it was on teens signing a pledge to "Just say no" – failed. Numerous studies tell us that the majority of people who have a substance abuse disorder started using drugs before they were 18, and that the disorder is already firmly established by age 20. The likelihood of developing a serious addiction is greatest for those who begin using drugs in their teens. Drug use can impair teens’ memory and concentration, which can affect their ability to learn. Statistically, teens who indulge in alcohol or drug use are more likely to get lower grades, to be absent from school, and to drop out of school entirely. Chronic marijuana use in one’s teen years has also been shown in some studies to lead to a loss of IQ that is not recovered even if the individual quits using in adulthood. The problems that many of us remember from high school and our teenage years were hard enough to handle on their own. Add drugs to the mix, and they can become impossible to handle. Teens who abuse drugs face a higher risk of strained relationships with family and friends. Their substance abuse can lead to anxiety, depression, arguments, emotional trauma, and even domestic abuse. Because teens are not allowed to buy marijuana even in states that have decriminalized it, drug use is pretty much synonymous with breaking the law. According to a study from the National Council on Alcoholism and Drug Abuse, among children and teens in state juvenile justice systems, drug use was a major factor in them ending up there. Four out of five of these kids meet one or more of the following characteristics: they test positive for drugs, they were impaired by drugs when committing their crimes, they were arrested for offenses directly related to drugs, or they admit to having problems with addiction. Getting caught with drugs can damage a teen for life. Many schools are now permitted to conduct random drug tests and locker searches. If a teen tests positive or gets caught with drugs on school grounds, the least that will happen to them is suspension from school. If the infractions are reported to the police, they can be charged with juvenile possession. If they get involved in selling drugs, the legal penalties are even more harsh, and can lead to large fines and/or prison time. The sad truth is that teens who become addicted to drugs don’t live as long as they should. They have more auto accidents and die from suicide or overdose far more often than teens who avoid drugs. The first thing you need to do if you suspect your teens may be using drugs is talk to them. Have an open discussion and express your concern. Don’t go in with accusations, because your teen will shut down and go on the defensive. Let your teen know that you love him or her and that you want to help them deal with whatever they are going through. If he or she admits to using drugs, you’ll need to ask additional questions to determine how often, what drugs are being used, and how serious the drug abuse is. You may be able to stop the habit before it becomes a full blown addiction. Ask your teen why they decided to use drugs in the first place. If emotional or stress related reasons are to blame, you can arrange for counseling or form a plan of action to prevent further drug abuse. If an addiction is suspected, you will need to get proper treatment for your child immediately. In the event that your teen denies using drugs, but you believe he or she is being untruthful, there are ways you can determine whether he has been using. At-home drug kits are available to test for many drugs, such as marijuana. Additional drug tests are offered by your doctor or another medical professional. If it is determined that drug abuse has been going on, approach your teen again and express your concern. Try to present your case in a loving, non-accusatory manner to ensure you get the best response. Treatment is far more effective when the person seeking recovery is a willing participant. Learn as much as you can about drugs, their effect on the mind and body, and their perils, and then communicate that to your teens in as open a way as you can manage. Find accurate, science-based information about drugs (as opposed to “scare stories” that any teen will instantly recognize as BS) and make it available. Remember the power of “peer pressure,” and that your teen will be encouraged to take drugs by their friends. And teens trust their friends, and seek their approval. So sit down with your teen and have a discussion in which you tell them it’s OK to say no, and help them develop strategies for doing so. There are a number of government websites that offer such strategies, such as the Ways to say “no” to drugs site from girlshealth.gov and the 6 Tactful Tips for Resisting Peer Pressure To Use Drugs and Alcohol site from the National Institute on Drug Abuse for Teens. If you are currently using drugs, it is important to understand the very real risks of overdose, addiction, and permanent damage: physical, emotional, and relationships. Prescription drugs are prescribed by a doctor for a reason. They are dangerous. If used incorrectly, or by someone for whom they were not prescribed, taking them can result in death by overdose or in dependence and addiction. Using other people’s prescription drugs can also lead to criminal charges, because the abuse of any prescribed medicine is a crime. And remember that so-called over the counter drugs can also contain chemicals that are deadly in high doses, and that can become addicting. Street drugs such as meth, coke, ecstasy, etc., all carry numerous dangers. They can be cut with poisons or toxins to make the dealer more money, but may kill you in the process. Dealers are not chemists. They are not doctors. They are drug pushers. They want your money, and they don’t care what they have to do to transfer that money from your pocket to theirs. They may not even realize that they are essentially killing you with their product. Just by being willing to sell you drugs in the first place, they have already demonstrated that they don’t care about your life one way or another. Marijuana may not carry the same levels of risk in terms of overdose, but many are now discovering that developing a dependence on it is all too real. Creating the habit of operating daily under the influence of a mind- or mood-altering substance leads to dependence. Getting high from marijuana also impairs your judgement. Not in the same way that alcohol does, but smoking grass does, in fact, impair your judgement. It also slows down your thinking and reaction times. This can not only present a danger, but it also prevents you from doing your best in school or being aware in social situations. If you or your teen has become addicted to drugs, the best course of action when seeking treatment is likely an inpatient facility. These rehabilitation centers combine a number of treatment approaches and techniques to ensure patients get the best synergistic therapies. Because many drugs can cause dangerous and even life-threatening withdrawal symptoms when you suddenly stop taking them, treatment will most likely start with a period of detox. After this medically supervised detoxification period is completed, it will be followed by counseling to get to the root causes of any addiction. Some rehabilitation centers offer programs specifically tailored to the needs of teens. They offer ongoing counseling and therapy, including peer or group therapies, as a synergistic approach to healing that is far more effective than either outpatient programs or programs designed for adults. And whether it’s your teen or you that is suffering from addiction, the most important thing to know is that help is ready and available. All that is needed to get on the right track to recovery is for you to take the first step. Get the help that is needed right now.